Are you seeking to build resilience and emotional strength, prevent overwhelming stress and burnout, despite the inevitable stressors you face in your career? 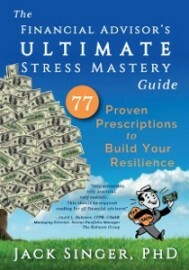 Featuring rich examples, easy-to-understand concepts, and powerfully simple behavioral tips, "The Financial Advisor’s ULTIMATE Stress Mastery Guide" explains how stress affects your health, how to proactively boost your psychological immunity, and how to maintain your optimism and successfully draw high-value clients into your practice and retain them, regardless of unpredictable markets and economic conditions. Action plans for mastering each type of stress you encounter. Success stories and experiences from highly successful advisors who have overcome the stressors inherent in your profession and are thriving. Winning strategies based on cutting-edge, cognitive/behavioral and resiliency research by top psychologists. Don’t let the challenges of financial advising weigh you down for one more day. This blueprint for success can help you achieve personal and professional goals, tackle every daily challenge, and reignite your passion for your career! "Dr. Singer has given the world of financial advisors a nearly impossible accomplishment - he has written a book that is intellectually cogent, very realistic, deeply practical, very actionable, and reflective of an extraordinary understanding of our business. If you are at all like me, our life as an advisor is one characterized by stress. Through Dr. Singer's book, I believe advisors can develop the skills necessary to have a stress-mastered business. This should be required reading for all top producers." "Dr. Jack displays a remarkable understanding of the stresses advisors face, and offers powerful "prescriptions" to help them overcome their sources of anxiety. As someone who has coached thousands of advisors, I can assure you that this is a book every financial professional needs to read!" 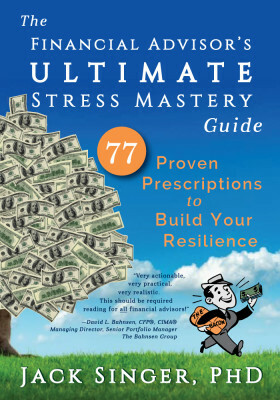 "The Financial Advisor's ULTIMATE Stress Mastery Guide is a MUST READ for financial advisors who feel chained to their book of business. With his step-by-step guide, Dr. Singer unravels the complex relationship between advisor and client, helping you find your own personal balance. Brilliant!"